Saying that Carolina Hurricanes center Victor Rask’s injury is inconvenient is an understatement. Despite a slow season by his standards in 2017-18, Rask was poised to begin this campaign in the top nine or even the top six forward group. At only 25-years-old, he’s a player that the ‘Canes want to keep around for a while given his six-year, $24-million contract extension. However, now the team must fill the hole created by his absence for the foreseeable future. Chip Alexander of the Raleigh News and Observer tweeted that, “[Rod] Brind’Amour says Rask could be out months,” and after having surgery on his fingers to repair tendon damage, that may be a conservative estimate. In any case, this begs the question: Who will take Rask’s place? There are a few candidates, many of whom are listed on the Hurricanes Prospect Pyramid designed by my The Hockey Writers colleague Tyler Leli, and any one of these guys could make an impact in Rask’s stead. 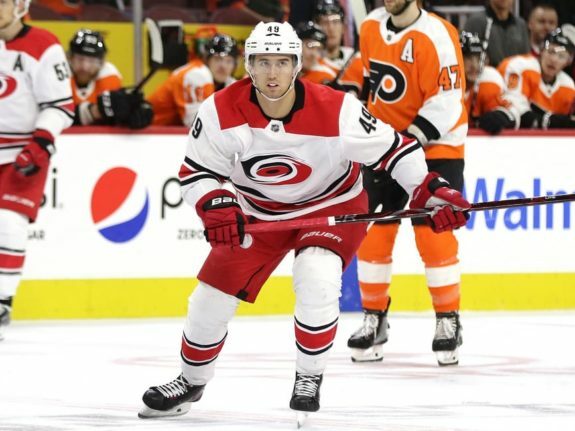 Zykov, originally a high second-round pick of the Los Angeles Kings, was dealt to the Hurricanes in 2016 and has had his best years at the pro level with the organization. He led the AHL in goals last season, with 33 in 63 games, before getting a call-up to the big club. In a 10-game stint, he showed his nose for the net and strong technical play, putting up three goals and seven points. Considered by some as a lock for a roster spot,Zykov could become Rask’s replacement. As one of the older rookies — with the most experience — Zykov could be an excellent addition to the ‘Canes’ lineup. He brings skill and physicality to the table and could be great in either a bottom- or top-six role. This is Canes Country’s pick for the spot. Wallmark always makes an impact when management gives him an opportunity. He led the AHL’s Charlotte Checkers in points last season despite only playing 45 games and has the most NHL experienced of this lot, playing in 19 contests over the last two seasons. The Umea, Sweden native is not pigeonholed into a winger role, either. Wallmark has played at center with Lulea in Sweden and Charlotte. This is especially helpful given that Rask was likely to play in the middle at some point this season, if not on opening night. Expect Wallmark to make a strong push for the spot. A year ago, Foegele wasn’t really on anybody’s radar. 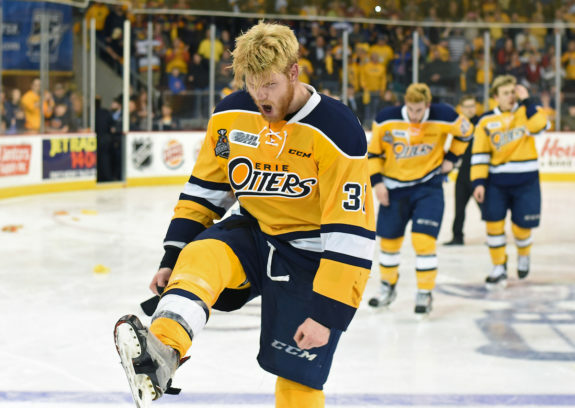 Sure, he had strong offensive numbers in the OHL, splitting time with the Kingston Frontenacs and Erie Otters, but most expected him to spend his first few pro years in the AHL. Yes, he has only played two NHL games, but he made a surprising impact in that short stint scoring in each of his two games. He also had a strong first year with the Checkers, playing with much heart and energy. Foegele will lead the charge in Charlotte if he doesn’t get the chance to play with the Hurricanes right away. At 22-years-old, it would be good to develop further in the AHL before seeing if he can be a full-time NHL player. However, he has many of the tools necessary to be an impact player with the big club which could earn him a chance right away. Easily the player with the most exciting pedigree on this list, Kuokkanen was a second-round pick by the Hurricanes just two seasons ago. After a strong showing with the powerhouse London Knights, he enjoyed a strong first pro season at 19-years-old last season. He even suited up for four NHL tilts in 2017-18, but recorded no points. What gives Kuokkanen an outside chance of securing a roster spot this season is his performance at training camp and during the preseason so far. He is the most skilled forward of the team’s prospects not named Andrei Svechnikov or Martin Necas, and had an incredible impact in his first preseason game against the Tampa Bay Lightning, recording three points alongside captain Justin Williams. On one play in particular, he received a pass with his skates, crossed the offensive blue line, took a shot on the far side of the net that produced a rebound that led to a goal by Micheal Ferland. His skillset may push him ahead of the pack. Do The ‘Canes Make A Move? Trading Jeff Skinner from a roster standpoint is bewildering. The Hurricanes struggled to score last year and yet they dealt a goal scorer. Now that Rask will miss extended time, the team’s scoring issues will resurface. What if the plan to improve from within fails in the immediate future? Will that force general manager Don Waddell’s hand to make a trade? A rough start could bury the Hurricanes quickly in light of the tough competition in the Metropolitan Division. 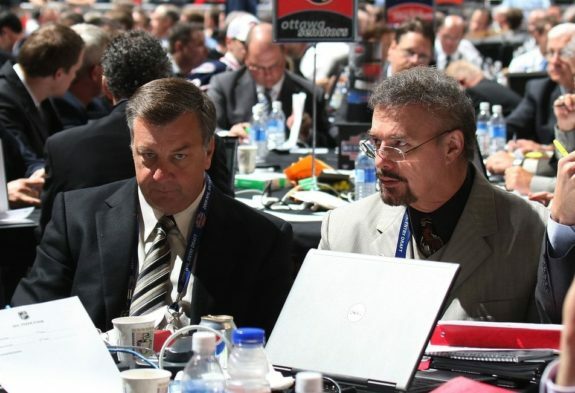 If they struggle to find scoring out of the gate, Waddell could look to acquire some help, similar to what Anaheim Ducks GM Bob Murray did last season when he acquired Adam Henrique because of injuries to centers Ryan Getzlaf and Ryan Kesler. 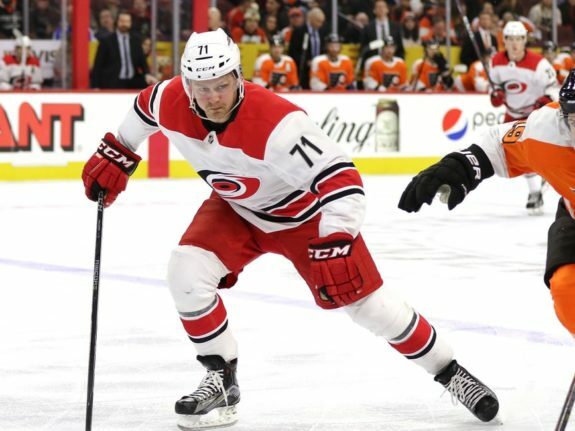 I could see Waddell using either picks or their plethora of defensemen as assets to bring in someone who could help carry the load for the ‘Canes up front, should the need arise. Ultimately, the Hurricanes have some nice options from within to solve the Rask problem. This may dictate how the beginning of the season shapes out for them.